If you ever want to do an event that gives you the biggest bling at the finish line then complete any of the Phoenix events. They are by far the best medals I have ever seen and they pride themselves on how good they are. Phoenix running is an all inclusive company that just loves to see people running, they don’t mind how far you run or how fast you do it, they just want everyone to get a stonking great big medal at the end having eaten a whole host of amazing sweets and chocolates at the aid stations. These leggings have a dinosaur fighting a unicorn. Therefore highly appropriate for a dino dash! 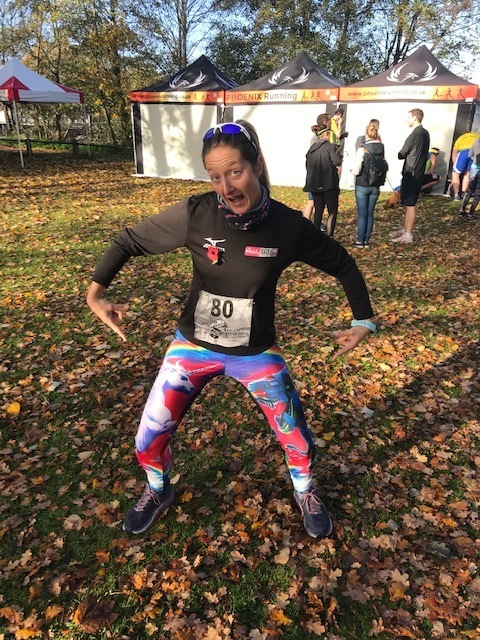 The dinosaur dash was not my usual type of event, but it had been added as one of my 30 endurance events of the year to replace a self created multistage event from the Coast to Coast of Devon. I decided to change the event due to illness from the Himalayan 100 ultra which finished only 5 days prior to this. The Devon coast to coast is a pilgrimage for me and I felt it needed more time, focus and appreciation then what I could have given it feeling so ill. I was not particularly looking forward to the Dinosaur dash. It started in Walton-on-Thames and followed a 3.3mile loop of the Thames for as many loops as you wanted to complete in a 6hour period. As mentioned some people competed one loop and still received one of the incredible medals. Most people completed a half marathon, others a marathon and a couple of us crazy people completed an ultra-marathon. The morning was bright and sunny, this was a huge bonus considering it had been raining constantly for two days before the event. The 3.3mile loop was beautiful, flat, muddy due to the rain, travelling past rowing clubs and nice pubs and past large houses. Amazingly some of my family members decided that they would take part in the event therefore the first couple of laps seemed to go by quite quickly. My Sister-in-Law (Ruth), husband (Will) and I were chatting away, and the first couple of laps felt like a bit of a discovery process. It then started to dawn on me that I still had 7 more laps to go! A lap race seems to be a double edge sword. There are both positives and negatives to laps. Positively, laps mean you know the course and the terrain, there are no unknown quantities, you are never far from the end if you wanted to stop, you are never far from aid, water and sweets. Negatively, it can be quite boring doing laps, if you are starting to hurt 3.3miles is actually quite a long way to push and mentally knowing how many laps you need to do can be difficult. As a little team we kept ticking off the laps, Ruth knew that she wanted to run a half marathon, (4 laps). Just before the 4th lap point Ruth decided to push herself and do an extra lap for luck, she did amazingly; it is always great to run as a little squad and she ended up completing 16.5miles, a medal well deserved. Ruths finished marked a half way point for me, mentally it became easier as I was on the countdown. Will and I did another lap, that went smoothly, picking up another handful of sweets at the aid station my Mum surprised us and decided to run a lap. It was great to have her running with us and it is amazing that she is also fit enough to do so. It was a fun lap. Now only two more to go. All participants were giving each other high-fives and cheering each other on, it really did feel like a team event. I was starting to hurt now, I was very bored of the laps and had just completed 27miles. Just one lap to go. Most people were finishing at a marathon so the final lap was quite lonely. I had just remarked to Will how amazing it was not to be rained on throughout the day and then it started to absolutely bucket it down. We got absolutely soaked. If only we had decided to stop at a marathon and not do an ultra-marathon; I think there is a lesson in that! I was pretty cold when we finished. 9laps and 30miles in 5.5hours. The magnetic dinosaur medal is just fantastic, Phoenix running are a great company and I would recommend taking part in one of their events especially if you are training for a marathon. A quick dash to the pub for a cup of tea and some food marked the end of event number 25 of 30 endurance events this year. Phew.